Providing you the best range of water cooled heat exchanger and thermic fluid heat exchanger with effective & timely delivery. Backed by the rich experience and a competent team of professionals, we are able to offer Water Cooled Heat Exchanger to our clients. Our offered exchangers are designed and developed with almost precision to meet the recent technical advancements in the market. Along with this, clients can avail this entire range of exchangers in a wide spectrum of specifications. We provide this range to our clients in at market leading prices. With sincerity and hard work of our professionals, we have carved a niche for ourselves in this domain by manufacturing, exporting and supplying Thermic Fluid Heat Exchanger. Used to maintain high temperature in heating room, these heat exchangers find wide application in various process industries. Provided exchangers are precisely designed at our highly advanced manufacturing unit following industry defined guidelines. 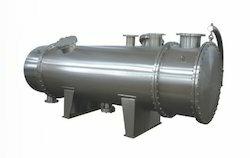 These exchangers can also be availed from us at the industry leading prices. Looking for Water Cooled Heat Exchangers ?